The development of the Jiangbei New District will bring enormous opportunities and challenges for the Yangtze River delta area and the Nanjing Metropolitan. The City of Nanjing underlines the need for innovative strategies for transit‐oriented, ecological, sustainable and low‐carbon urban development. Integrated urban design and landscape design will be needed for the most important nodes and areas of the Jiangbei New District. 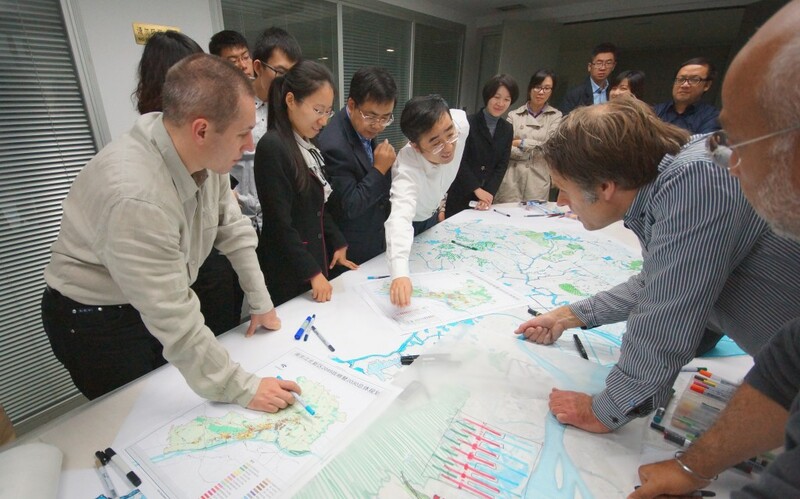 The Nanjing Urban Planning Bureau cooperates with many local and regional organisations, like the University of Nanjing and the Nanjing Institute of City and Transport Planning, as well as with national and international institutions such as the Urban Planning Society of China (UPSC) and the International Society of City and Regional Planners (ISOCARP). Regions and cities need new approaches to ensure the future liveability and prosperity for their communities, citizens and enterprises. First of all, liveable regions must ensure the basic needs for food, housing, safety, utilities and amenities, education and culture, healthcare and mobility. Secondly, cities should make use of the human potential, creativity and talent of their inhabitants. Thirdly, cities must preserve and restore the natural and cultural assets to ensure liveability and modern continuity with the historical past. A UPAT has the potential to make a valid and crucial contribution to enhance awareness, to develop strategies, to propose policies and to stimulate a set of integrated activities that would help the city and its communities to become more liveable, sustainable and prosperous and, at the same time, generate more tangible economic activity for the future prosperity of the region and its settlements. 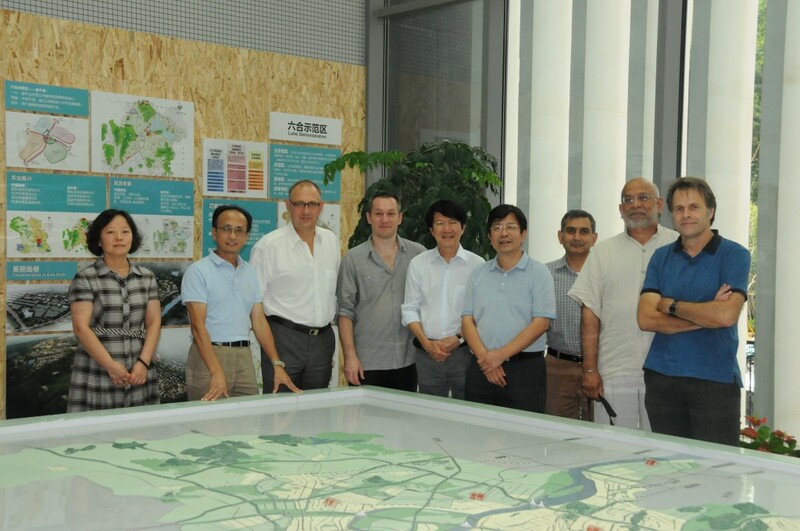 A UPAT team was invited to assist the Nanjing Urban Planning Bureau in making practical visions, designs, implementing tools and steps for the Jiangbei New District. The Bureau is working on a comprehensive development strategy and an integrated spatial plan. The UPAT comprised the following members: Martin Dubbeling, the Netherlands (ISOCARP Vice Presidents UPATS), Dhiru Thadani, India/USA (Team Leader), Awais Piracha, Australia (UPAT Rapporteur), Jos Verweij, the Netherlands, Tomasz Majda, Poland, Liang Huew Wang, Malaysia/Hong Kong. 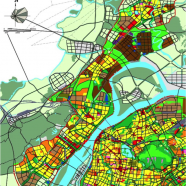 The ISOCARP team of experts has identified eight “principles” for the Jiangbei New District. The ISOCARP experts strongly advised to consider those principles in the subsequent steps and phases of planning, urban design and development of the Jiangbei New District. The 2049 Strategy Planning and 2030 Overall Planning for the Jiangbei New District are primarily focused on fast economic development and rapid urbanization. This needs to be changed. The two plans need to be focused on the well-being, health, connectivity and on providing opportunities to the present and future inhabitants in a clean and safe environment. The inhabitants will need to be involved in the 2049 Strategy Planning and 2030 Overall Planning for the Jiangbei New District. The 2049 Strategy Planning and 2030 Overall Planning for the Jiangbei New District lacks an overall ‘vision’ for its future development. This ‘vision’ should encompass the natural environment that surrounds these fast-developing neighborhoods. 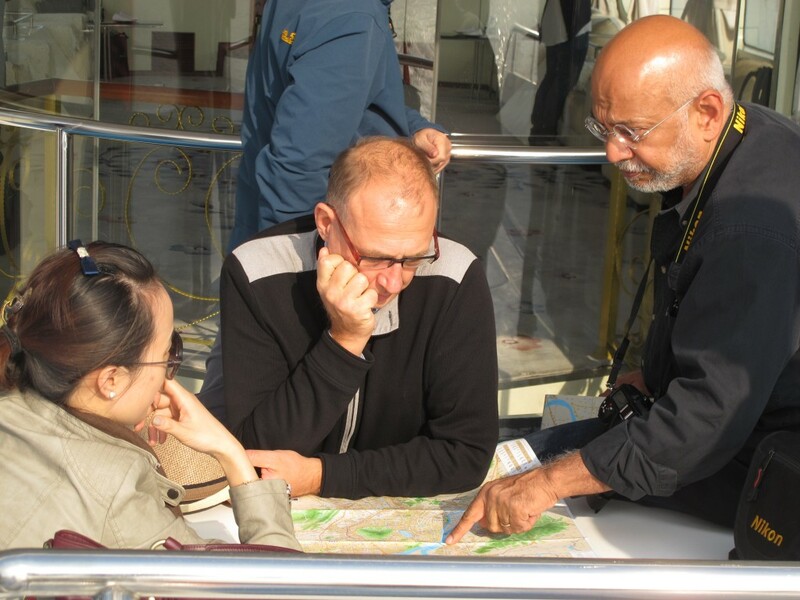 The spatial development strategy should be broad based on a regional scale, and must take into account future developments that may occur in adjacent provinces, which will surely impact the water quality and run-off in the Jiangbei New District. The Jiangbei New District is largely built and planned in the floodplain of the Yangtze River and the numerous smaller rivers feeding it . The Macha River and the Chuhe River are examples of two such feeder rivers. 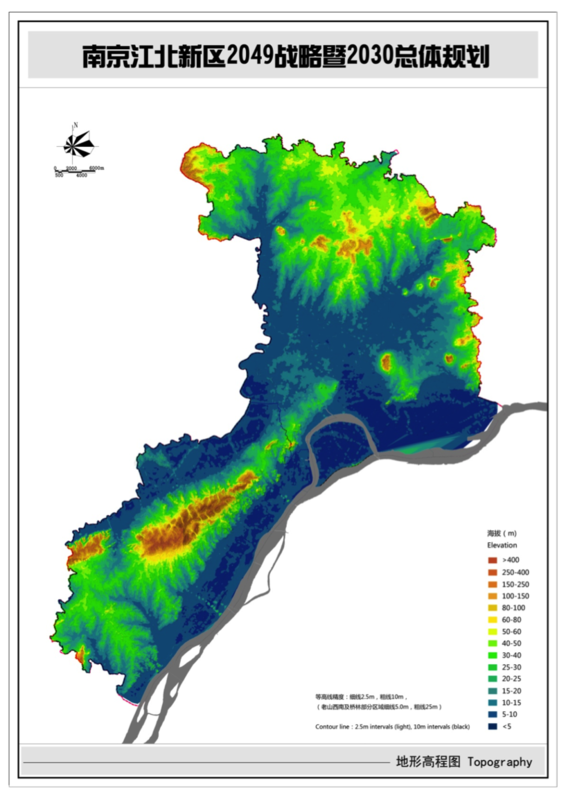 In order to create safe living conditions and in order to create sufficient water buffer capacities for wet and dry seasons, it is imperative that Blue-Green and Blue-Red Strategies are developed for the Jiangbei New District. The Jiangbei New District currently is a nondescript urban environment that is similar to many other Chinese towns and regions. The 2049 Strategy Planning and 2030 Overall Planning should direct the Jiangbei New District towards a unique quality and distinctive identity. This quality and identity should have ‘liveability’ as its core mission, which is needed to make the Jiangbei New District competitive with other regions. Public transport rail and metro lines should be used as catalyst for urban development within the Jiangbei New District. A 1 km radius around all proposed stations should be designated as a TOD overlay zone with specific design guidelines which follow best practice standards. Given its central and strategic location, the Jiangbei New District must be very well connected by high-speed rail with Beijing, Hangzhou, Nanjing-South, Shanghai, Suzhou, Wuhan and other Chinese cities. The Jiangbei New District must become an example in China of well planned, designed and built Transit Oriented Development. The present and proposed density of the Jiangbei New District is much too low to make an attractive and vibrant city. In fact, density should be more than doubled in the Jiangbei New District. The present and dominant urban form with fragmented high-rise, scattered functions, broad avenues and extreme contrast needs a radical change. The much higher density combined with the improved urban form will enhance diversity, flexibility and dynamics of the Jiangbei New District. A more efficient stewardship of the land will also allow successful implementation of the Transit Oriented Development. Large parts of the Jiangbei New District are in need of transformation and redevelopment. Drastic measures are needed to create a safe, clean and healthy environment for its present and future inhabitants. Transformations in many leading cities in the world have shown that out-dated and polluting industries must be replaced by higher-yielding and low-emission enterprises within a new economy. The Jiangbei New District will need to develop a distinctive and attractive identity. The Jiangbei New District should become a leading example of a liveable city that is sustainable and that has a low carbon footprint. The blue-green and blue-red strategies, combined with Transit Oriented Development, a much higher density and cleaning up the out-dated and polluting industries would be the first steps in that direction. In the future, Jiangbei the New District must become an area that is largely self-sufficient in energy, water and food production. These principles are very demanding and will require careful thinking and design. It will require investments in training and capacity building of everybody involved in city planning. It will require investments in cooperation with other organisations, disciplines and governments. It will also require investments in the communication with the present and future inhabitants.